As the jeep bounced its way through the red dust and the bumpy narrow road, we stumbled upon what looked like a refugee settlement. But as we drove nearer, gold mining shafts became visible. We were approaching one of Tanzania’s many small-scale gold mining areas, Rwamgasa, a small village in Geita district. Located at the heart of the Lake Victoria gold field, about 1,000 km northwest of the country’s capital, Dar es Salaam, Geita district has one of Tanzania’s richest gold deposits. 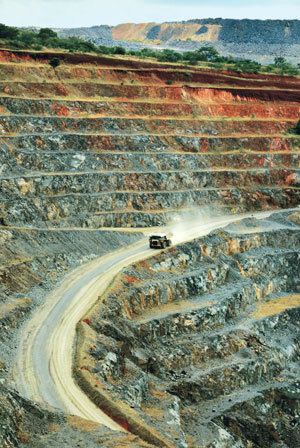 It is home to the country’s biggest gold mine, the Geita Gold Mine (GGM). Here, local people dream of digging their fortune. “It can bring us quick money,” says Mosi, who works as a labourer in one of Rwamgasa’s small mines. He, along with many others, toils the gold fields in sweat and dust with such hope. But Tanzania faces basic socio-economic challenges. About 80 per cent of its population lives below the poverty line. Big foreign companies dominate the gold mining industry. At the same time, small-scale artisanal mining by local communities occupies a very prominent livelihood space in the country’s economy. As per government estimates, there were about 650,000-750,000 artisanal and small-scale miners in the country in 2014, which most people say is a gross underestimate. Artisanal small-scale gold mining (ASGM) activities are taking place in many regions of Tanzania, particularly in Geita district. It has become an important component for alleviating poverty, claim officials of Geita’s mining department. While ASGM accounts for roughly 10 per cent of Tanzania’s gold production, its share of employment is disproportionately high—up to 90 per cent people are working in ASGM. In Rwamgasa, one can see stretches of ASGM activities scattered around the area. In some places there is a concentration of mine shafts, at others there are just two or three. Many of the shafts are also half dug. “People start digging the shafts and if, after a while, they do not find gold, they just move on to another place,” says Ramadhan Mcharo, a regional mining officer in Geita. The unscientific nature of digging as well as the desperation is evident. Small-scale mining operations are labour-intensive and dependent on basic technology. Mining is done manually through very crude methods. The place where I was taken to in Rwamgasa is one of the biggest sites of the small-scale mining activity. Spread over an area of about 150 hectares (ha), it had 50-60 mine shafts. Labourers use shovels, hammers and chisels to dig the mine shafts and work their way through for the gold. From the surface, one can see only the deep narrow tunnels; the average depth is about 10-15 metres. On the top of a working mine shaft stands a pulley. As two men unwind the rope and put a sack down the shaft, the people below fill it and the sack is pulled up. The ore is carried to nearby villages where gold is extracted. I headed to a village where the ore is further processed. I found both women and men engaged in the activity. 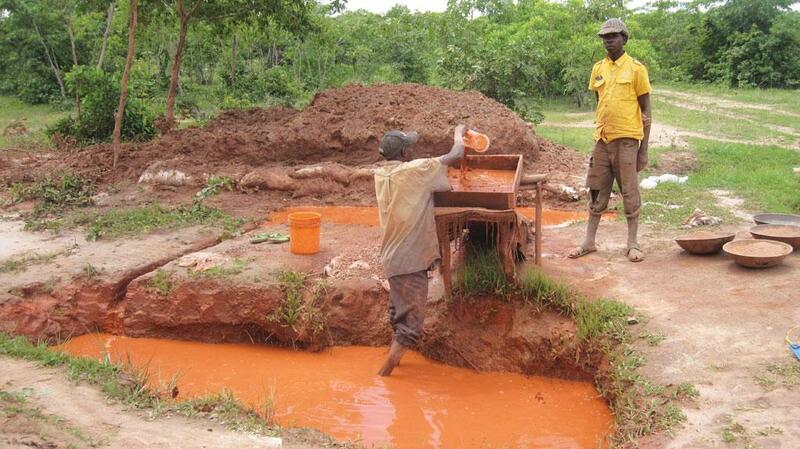 The typical method of gold extraction here is highly toxic. Mercury amalgamation, a simple and inexpensive way to extract gold, is the most common practice. However, people take little precautions and work with bare hands. They also inhale the toxic mercury vapours emitted in the process. “Burning mercury is a common activity around the region,” says Vianey Mbuya of Nalico, a non-profit working on human rights issues in the area. Though the ill-impacts of mercury have been widely recognised, the practice continues. Studies indicate that about 27 kg of mercury is released into the environment in the Rwamgasa area each year. The impact is evident. 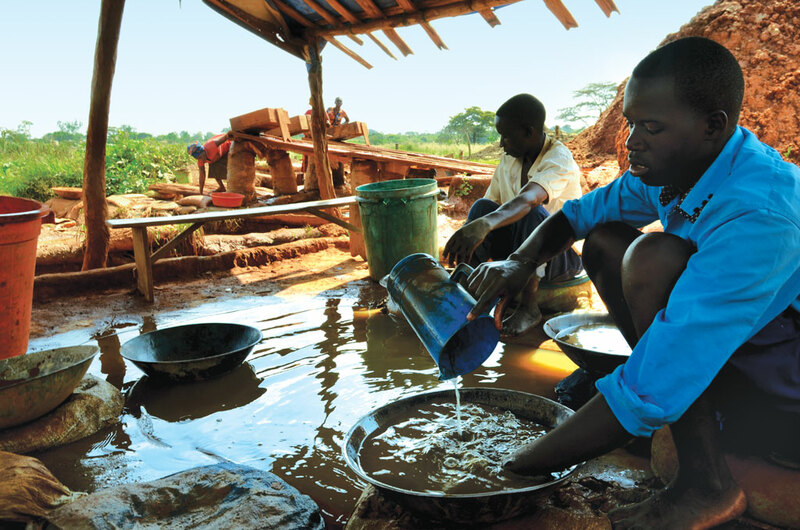 A 2010 study, Health Assessment of Artisanal Gold Miners in Tanzania, showed that mercury levels in the blood of adults working in the area was as high as 33.3 micrograms per litre (µg/l), with 95 per cent of subjects having mercury levels about 15.5 µg/l. This far exceeds the normal level of mercury in blood, 0-5 µg/l, according to Human Biomonitoring Standards of the Federal Environmental Agency, Berlin. A major factor that compounds the problem of small-scale artisanal mining is possibly the confusion about the legal status of such activity. A general perception in the mineral sector is that small-scale miners are those working with legal permits while artisanal miners are those who mine illegally without permits. Such understanding stems from the way mining activities are categorised under Tanzania’s Mining Act of 2010. The law defines small-scale mining as those operations with capital investment less than US $100,000. However, it does not provide any definition for artisanal mining. Though ASGM is a key supporting structure for the rural economy, the major players in the country’s mining sector remain big foreign companies. 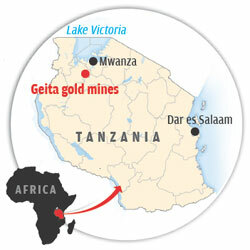 Large-scale mining in Tanzania, as of now, is centered on gold. The country is the fourth-largest producer of gold in Africa. According to the Tanzania Minerals Audit Agency (TMAA), gold production from the major gold mines (seven) in 2013 was about 1.25 million troy ounces (toz), which is worth US$1.74 billion. Currently, five of the seven gold mines are operational. The industry is today dominated by two multinationals—a Canadian company, Acacia, and a South African firm, AngloGold Ashanti. Even officials acknowledge that large-scale mining activities have not contributed significantly towards poverty reduction in the country and the sharing of mining wealth has been poor. The Ministry of Minerals and Energy’s (MEM) own resettlement and policy framework document of 2015, says, “The benefits of large-scale mining in terms of poverty reduction and shared prosperity have been below expectations.” The poor share of benefits is evident in what the government refers to as a “modest reduction of rural poverty which afflicts 83 per cent of the estimated 13 million Tanzanians living below the poverty line”. Though mining companies boast of their Corporate Social Responsibility activities, there is growing discontent among social communities. Kizito Kondamwali of the Mwanza Policy Initiative, and a native of Geita district, says that the benefit the communities have received in the gold mining areas is nothing compared to the profits made by the miners. “The big gold mining companies barely have any social participation,” says Masud George, assistant progra-mme officer at the Legal and Human Rights Center in Dar es Salaam. The problem is that there are no provisions under the mining law to ensure that communities benefit from the mining. Worse, the country has been losing billions of dollars over the years simply as a result of fuel levy exemptions granted to six large mining companies. Researchers at the Economic and Social Research Foundation, a think tank, and Haji Semboja, faculty member at the University of Dar es Salaam, make repeated references to the high-profile 2008 Bomani Committee report, which highlighted the problem. Headed by Judge Mark Bomani, the Report of the Tanzanian Presidential Mining Review Committee to Advise the Government of the Mining Sector highlighted several issues concerning the sector. Prominent among them was that communities were bereft of mining benefits. It recommended that the issue of living condition of those who were seriously affected by mining activities be taken care of quickly. “Lack of being paid the correct compensation, allocation to new settlement has led to a misunderstanding which have caused tension and insecurity in mining area,” the report observes. “The government started taking measures such as revising provisions of levy for mining companies,” says Benjamin J Mchwampaka, assistant commissioner for minerals, southern zone, Tanzania. In 2012, the government amended the Local Government Finance Act, 1982. The amendment requires mining companies to pay a service levy at a rate not exceeding 0.3 per cent of the net turnover of the value added tax and excise duty to their respective district councils in their area. Earlier, companies had to pay a maximum of US $200,000 per year to the government. But transparency and accountability remain major concerns. While the Tanzania Minerals Audit Agency and the Tanzania Revenue Authority have been traditionally tracking disclosure by the mining sector, in recent years, the Tanzania Extractive Sector Transparency Initiative (TEITI) has become a key institution for ensuring this. While miners, particularly medium-scale ones, remain at fault about disclosing payment to the government, records maintained by the government too are often poor. To bridge this, TEITI collects tax payment receipts from private companies as well as related documents from the government and then prepares a comparison report that shows discrepancies between payment made and receipts availed. “But since TEITI is not instituted by law, disclosure of information and increasing accountability is becoming an increasingly challenging task,” says Benedict Mushingwe of TEITI. To strengthen the body, the Tanzania Extractive Industries (Transparency and Accountability) Bill, 2015, has been introduced in Parliament. As I gathered bits and pieces about the people toiling the grounds, the administration, the mining companies and the civil society at large, what emerged was the struggle of a country trying to balance its economic priorities with the aspirations of its people. In many ways, the scene seemed familiar to India’s own mining woes. The stories were more of a shared experience.